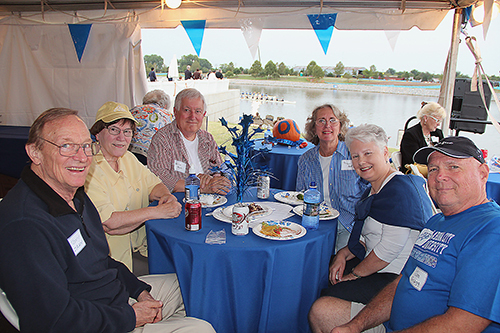 The OCU Alumni Association welcomed retired clergy and their spouses as special guests Sept. 28 for "A Great Evening on the Oklahoma River," during the OCU Head of the Oklahoma Regatta. Almost 30 Metro Retirees were expected in the alumni’s big tent at the Devon Boathouse, home for OCU’s rowing and canoe/kayak teams. Cheering the Stars on the river are, from left, Tony Zahn, Ginger and Wes Howl, Maggie Ball, and Elaine and Jim Gragg. The Metro Retirees are one branch of the Conference’s retired covenant family organization, whose president is Jo Ann McNaught.